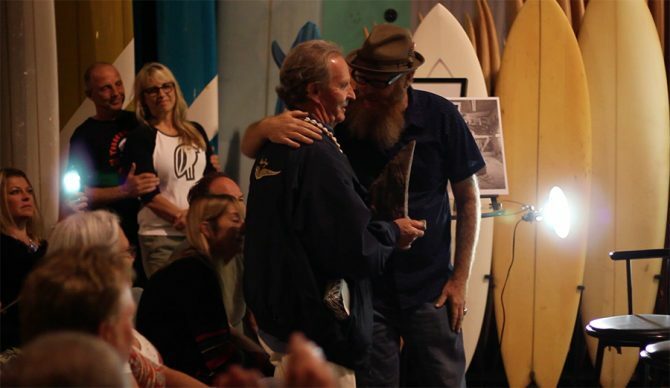 Surrounded by friends and fans, Skip Frye was presented with the Lifetime Achievement Award at the San Diego Surf Film Festival this May. Frye has not only shaped the boards and surfing style that is so ingrained with the San Diego surf community, but he’s also shaped the lives of the people lucky enough to know him. Frye has literally changed the progression of surfboard design since the mid-1960s with the creation of the egg shape, as well as 50 years of foiling and refining fin shapes and sizes. His commitment to moving forward and progressing surfboard and fin design is one of the longest in the history of surfing, and many shapes ridden today have their roots planted in old outlines pioneered by Frye decades ago. San Diego has been home to many amazing surfer/shapers for decades, like Hynson, Diffenderfer, Ekstrom. The list is lengthy, to say the least, but Frye is a name that has elevated beyond the others because of his longevity and commitment to the act of wave riding above all else. He never got sidetracked chasing money or machine-milling blanks to increase production. Most of all, when others kicked out, Frye never stopped surfing or shaping. Frye is revered for his lack of ego and ability to let his actions do the talking where others choose the opposite. How many of your heroes do the simple things like pick up trash everyday? He’s the first to deflect praise to those who came before him, and to redirect the conversation so it isn’t about him. One gets the feeling Skip was the kid in school who sat in the back corner of his class, excelling at his work but not wanting to be seen or have attention drawn to him. With minimal ego and maximum humbleness, Frye is what we all love about a real hero. He’s human. He’s flawed, but yet he somehow climbed past life’s hammers of homelessness, drugs, alcohol and depression to grasp a level of greatness and respect that few have ever achieved. As the lights dimmed, the crowd watched never-before-seen home movies filmed by Skip’s wife, Donna Frye from over 25 years ago, knowing they were part of a very special evening. Hank Warner was the night’s host, and he navigated between video clips with funny and personal stories of Skip, whom he has known for 50 years. Women’s surf pioneer Linda Benson shared her memories of meeting Skip for the first time at Swamis in 1966. Eventually, Skip rushed the stage to tell the crowd how when he first saw the beautiful girl surfing and was blown away by the impression she made. The moment was touching to say the least. Over the course of the evening, Bird Huffman, Masa Rogers, and Josh Hall shared their personal stories and insight of their relationship with Frye, and there were video messages from Bill Hamilton, Bob McTavish, Stevie Lis and Peter Pope Kapahea. There was even a note from Skip’s favorite surfer of all time, the enigmatic Phil Edwards. It’s not everyday that people get to get to know their heroes, much less become friends with them. Could you imagine what it would have been like to play catch with Babe Ruth or Tony Gwynn? That’s exactly the feeling you get when you paddle out and see Skip wheel into a wave, seeing that one-of-a-kind style as he passes you on the wave and later talk to him as you both wait for the next set. Access to our surfing legends has always been the magic of surfing and Skip Frye is one of our last remaining elders who holds the stories, the memories and the aloha that’s the glue of the San Diego surf community. He is the compass that points to True North.